Another Beneteau Flyer 650 Sun Deck, this one built in 2013, is just like the rest of them - a fun-filled day out on the sea is guaranteed. 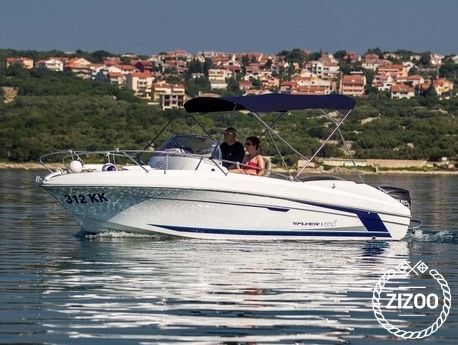 Watersports enthusiasts love them - she has a fitted turbo swing so you can do some wakeboarding, water skiing or even tubing. If you need to rent any additional equipment, your charter team in Punat Marina will be happy to help. You can also ask them to suggest some routes, depending on what you would like to see or do. Islands in the area such as Cres, Losinj and Rab have plenty to offer. Her speed of 30 knots will get you there in no time. For lovers of different type of adrenalin, go to the west side of Cres and hike up to Lubenice, 378 meters above sea level. The beach below, listed among 50 best world's beaches is another reason worth a visit. Swim into the blue caves next to it, for that extra magic touch and your day will be just perfect! Für uns eine neue Erfahrung, das Modell. WIr hatten aber eine gute Zeit an Bord.